I went to 5 festivals and saw more bands in 3 months then most people see in the entire year. So the summer festival season in the bag I present to you my top 5 five favorite live acts of the summer. Love him or hate him (and trust me I hate him) he brought the muddy and pissed off crowd at Randall's island together for a stellar performance. I was present for the debacle of Kanye West's Bonnaroo performance and very skeptical for his headlining set at Govball. But he killed with a combination of his enormous hit catalog along with starting and finishing with his new hit "black skinhead". Back in January I remember hearing rumblings from Jenny Lewis' camp that she was practicing her synth work. Along with the first remnants surfacing of a postal service reunion. So when a 10 year reunion was announced with Jenny Lewis providing back up vocals, I forked over the cash to see them at Barclay. Postal Service, fronted by Death Cab for Cutie's Ben Gibbard created a masterful synth pop album 10 years ago. A album that was never meant to be played for a arena crowd. The fine line of being able to play intimate songs in a epicly large setting is a tough and meticulous endevour. But Ben and Jenny didn't disappoint and sent me right back to my high school years. I made a list the first summer I ever went to a music festival, the list contained the my top 20 must see artists before I die. This was when I was 18 and most of the musicians on the list I have either seen or I have grown out of. But number 3, behind Neutral Milk Hotel (which will hopefully happen next year) and The White Stripes (which will never happen) was the Red Hot Chili Peppers. 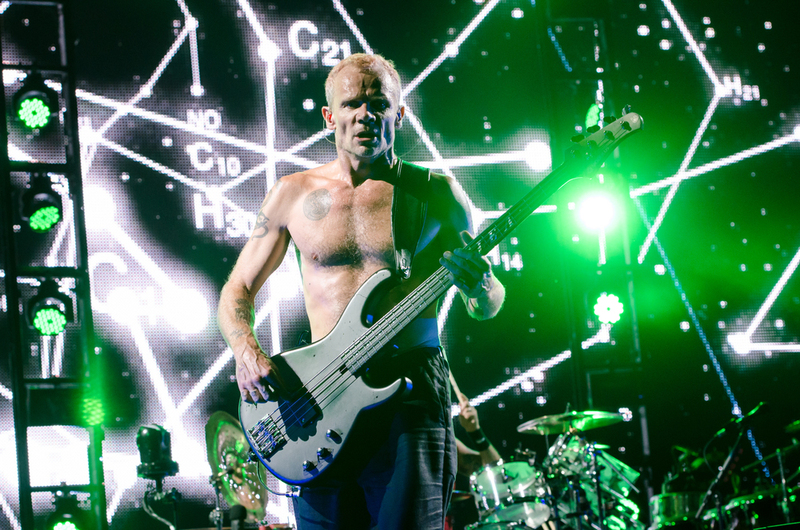 Flea has been a dream for me to Photograph since i found out concert photograph was a thing and my high school career revolved around Danni California. I can not express how insane it was to shoot the Peppers or be that close to a band that big. There is a odd energy that comes off the stage that carries with you for a wile. The last time I saw Mumford and Sons it was 2010 at the Which Stage at Bonnaroo. Since then they played with Bob Dylan at the Grammys and won Album of the Year, folk music doesn't always translate to huge venues. But Mumford and Sons isnt your typical folk band, they bring a energy that is closer described as punk. its fast paced and foot stomping folk and they're newfound fame hasn't jaded or diminished these british gentlemen. My Favorite concert this year didn't come from the huge set design of JT and Jay Z, or even the headlining performance Guns and Roses or Beck. The Lone Bellow have blown up in the last year, they literally went from working 9-5s to doing a national tour over night. the attention is well deserved. They're sound reminds me of a mix of mix between the Lumineers and Of Monsters and Men. Their performance, reminded me how at in the end, lights, dancers, and smoke machines dont matter. Leaving everything you have on stage is all that matters.